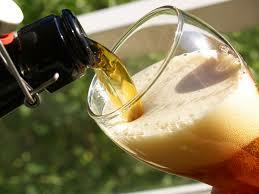 Beer is one of the world’s oldest beverages, dating back thousands of years to ancient Egypt and Iraq. People drank it for centuries, but never really understood the chemistry of what turned its ingredients to alcohol. The secrets of successful beer don’t come from witchcraft, but from brewer’s yeast, or Saccharomyces cerevisiae: a microscopic organism that has fascinated Withee for decades. It’s integral to fermentation, the chemical process that transforms ordinary water boiled with grains into a tasty beverage. “You take a sweet extract from grain, and over time it’s converted into a beverage with all kinds of amazing flavors and ethanol and CO2,” said Withee. “Yeast that’s sold to people that make wine and spirits and beer comes in two basic forms,” said Withee. “There’s liquid yeast and there’s dried yeast. Both of them are alive and active. Liquid yeast is exactly what you would think it is. It’s a live culture that’s grown up and concentrated into a wet slurry.